The all new NLP250-DC high-density, open-frame switching power supply is designed to operate directly from a -48VDC telecom central office power bus and supports a wide input voltage range of -38 to -60V. 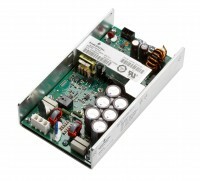 It can deliver 250W of continuous power with forced air to support battery backup and high-availability applications. The NLP250-DC features a compact 4 x 7 inch footprint – identical to AC models to facilitate a drop-in alternative for OEMs – and offers a low-profile component height of 1.5 inches to support a variety of 1U telecom applications.